No matter how much Congress softens the sequestration’s austerity footprint, everyone in government will have to nip-and-tuck in order to balance budgets. And that will include the Pentagon – something that Secretary of Defense nominee Chuck Hagel and even the Bowles-Simpson commission support. We cannot afford to continue a clear and present double-standard in Washington, DC while also keeping the government accountable to its taxpayers. On one side of the discretionary spending spectrum, Republicans are absolutely religious about each government dollar doled out, and are quite keen to see sequestration cuts – to “entitlement” programs. On the other side, cuts to defense spending and oversight of the Pentagon is not up for discussion. In fact, Republicans, joined by some conservative Democrats, are now going further. They will fight to ensure that no defense cuts whatsoever be included in any deal to forestall the automatic sequestration. In part, this double-standard exists because the military-industrial complex has built components of the war-making puzzle in every congressional district across the US. But the double-standard also comes from lobbying. In the last decade, defense contractors have steadily ramped up their lobby presence in Congress: in the last year alone, Northrup Grumman increased lobby spending by 51%, and Lockheed Martin by 25%. And they were already big spenders – showering Congress with nearly $30m and $26m, respectively. Their return on investment has been substantial: lobbying has been no small part of the 81% total increase in defense spending since 2001. “Bloated” – to borrow Hagel’s epithet for the defense budget – is an understatement. If anything, the sequestration’s small incision of $55bn a year would ensure, not jeopardize, the sustainability of our national security. But here’s where congressional fiscal blindness becomes most problematic. Amid Pentagon pontification about sequestration cuts to defense spending, and their supposed deleterious impact on national security, it turns out that the department of defense has no clue at all about its own fiscal outlook. 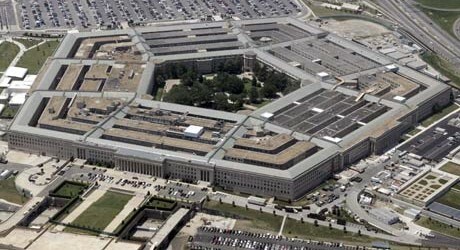 The Pentagon is crying wolf on a sequestration deal without even knowing how many sheep are at pasture. Take a look. This month, the US Government Accountability Office (GAO) – the independent, non-partisan “congressional watchdog” that investigates how the federal government spends taxpayer dollars – was unable to audit the department of defense or the department of homeland security. The majority of the 24 other agencies were auditable, but neither defense nor homeland security were among them. Curious. One wonders where audit-hungry Congressman Darrell Issa is, as head of oversight in the House of Representatives. He’s vented much vitriol on accounting irregularities far less consequential than this one. And Issa should be irate. The departments tasked with tracking specific threats to America can’t even keep tabs on how many hundreds of billions of taxpayer dollars are spent either stateside or in war zones, the latter of which the special inspector general for Afghanistan reconstruction (Sigar) has illuminated for years. Corruption, kickback schemes, bribery, conspiracy, fraud, waste, and abuse – measured in millions of dollars – are quite common among US military ranks, from Kabul to Kirkuk. Despite this proverbial slap on the transparency wrist, can we expect the Pentagon to have its financial ducks in a row anytime soon? Not even close, says GAO: the Pentagon’s plan is to prepare auditable, department-wide financial statements by 30 September 2017. Nearly five years from now – that’s how soon the Pentagon will be able to show Congress its financial statements for auditing. Until then, therefore, any claims by the department of defense regarding the impact of cuts must be pure conjecture. So the time to audit the Pentagon is now. By 2017, the US national debt will have mushroomed even further – thanks, in no small part, to bloated defense spending. The now-tired quote by the former joint chiefs of staff chairman, Admiral Mike Mullen, regarding the national debt as our biggest security threat, must compel his colleagues in the military to ensure this threat does not worsen. And that effort begins at home, in the Pentagon. It is time to clean up your act, generals, before the creditors come calling.